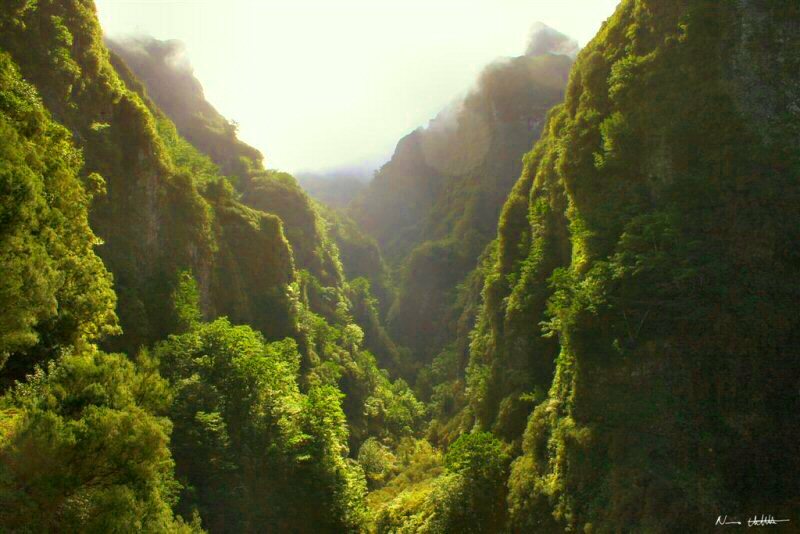 Sábados: 10:00h - 13:00h; 15:00h - 18:00h. 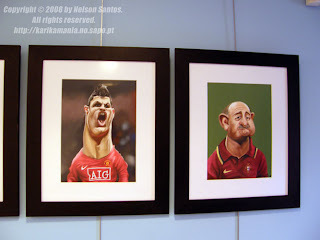 Esta exposição incorpora a minha primeira tela em acrilico (para descomprimir das caricaturas digitais photoshopianas) e será uma das primeiras que posteriormente estará também presente em futura exposição na biblioteca de Salvaterra de Magos. 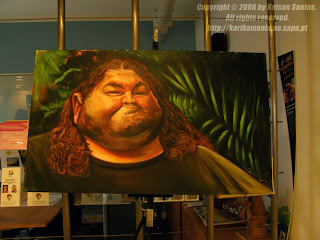 O quadro é do famoso Hurley da série Perdidos ("Lost") o tamanho é de 90x60cm aprox..
No periodo de Festas da Moita de 12 a 21 de Setembro será possivel fazer caricaturas a preços acessiveis, quase de borla para falar a verdade mais um motivo para que não faltes a esta amostra de humor! 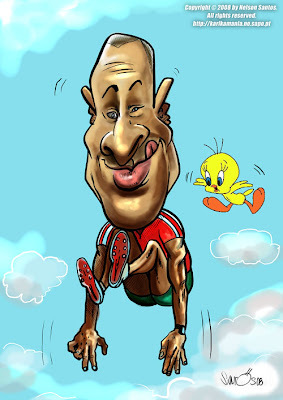 Caricaturas de Ronaldo, Scolari, Madonna, Dr.House e Pamela Anderson. Não não é o Hulk que estavam a pensar... não tenho palavras para descrever aquela bomba do Hulk o novo jogador do Porto apenas posso adjectivar de "Incrivel" mesmo parece que este campeonato vai ser muito bom e como esta semana vem ai o clássico Benfica-Porto vai ser interessante ver como reage a equipa de estrelas do Benfica com Aimar, Reyes, Di Maria versus uma equipa de lutadores como a do Porto com Lucho, Rodriguez, Lisandro; digam o que disserem este jogo vai decidir o desenrolar do campeonato pois o Benfica perdendo vai desmoralizar e o Porto perdendo vai acusar ter perdido a supertaça para o meu Sporting e sim ainda estou um bocadinho desconfiado, acima de tudo o que interessa é ver espectáculo como foi aquela bomba do Hulk ou o calcanhar do Yannick Djaló. Finally i got my copy of the Facial Expression Babies to Teens by Marc Simon for which i got an award at the Orlando 2006 NCN Annual Convention(you can see here the drawings i have made for this book). 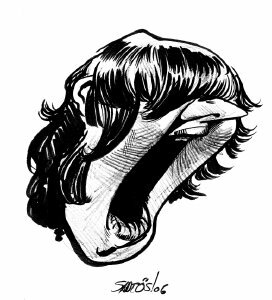 I was so fond with this drawing that i turned it as a logo for my caricature business. I sure hope to be in the North Carolina Raleigh Convention this year and review old friends. Facial Expressions: Babies To Teens; A Visual Reference For Artists by Mark Simon is probably the most unique and possibly the most valuable. It's a big book, 256 pages (with a free Internet supplement available), and entirely filled with reference pictures of, you got it, babies to teens. Each model tends to get between 2 to 4 pages of 2 1/4 inch to 2 1/2 inch square head shots with a tremendous variety of expressions and poses. Other chapters include a skull gallery, hats and headgear, a phonemes gallery (mouth shapes for various sounds), and an age-progression gallery (shots of the same model over a wide range of years). Well that's it actually. It's a big book of photos, well put together and incredibly handy to have in reach while at the drawing table. I recommend this book to any artist involved with character design or illustration. Tenho a certeza que o Nelson Evora vai trazer mais uma medalhita para Portugal e não é só por isso pá vê se honras o nome que ostentas Nelson tens que fazer história meu só te peço o ouro traz lá isso ok? Voa!!!! De preferência acima dos 18 metros... mas cuidado com o tweety. 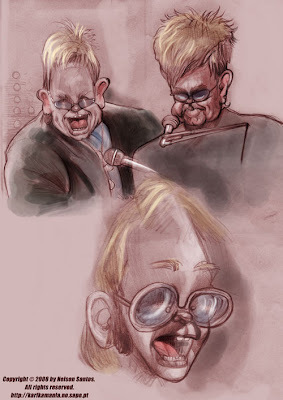 These Elton John caricature sketches were done for a regular caricature competition at the NCN- National Caricaturists Network its an international non-profit organization dedicated to the art of caricature. 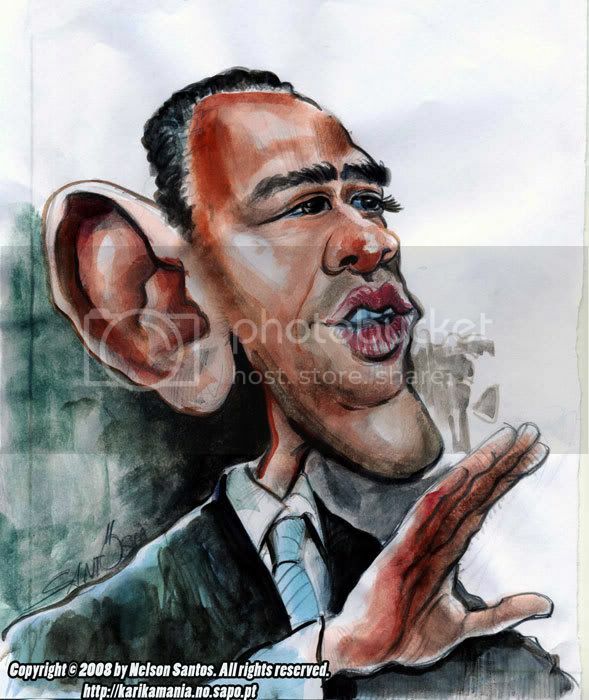 It is made up of professional caricaturists from all over the world, students of caricature and people who have an interest in the art form. I might choose one of these three sketches to colour it, still haven't decided which one because artist vision changes day to day, when i finish a drawing i´m happy with it, but the next minutes i hate it! Maybe i´m pushing myself? I don't know it just happens frequently. 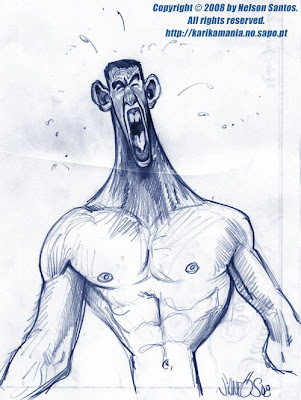 This is a sketch and study for a future caricature of the amazing Michael Phelps i tryed to phocus not only on his expressions (he has an amazing and funny face for caricaturing!) 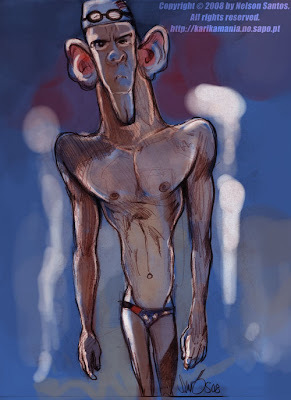 as well on his anatomy like his long arms. I also accented his shoulders i believe those are his secret weapon as such a powerful swimmer. Who thinks he gonna stops winning more medals on Beijing 2008? I´m betting on him again! 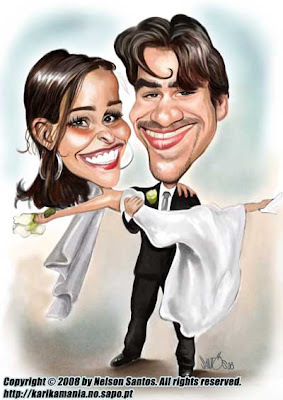 Caricatura para Convite Casamento. Enviamos para todo Mundo. Se vai casar e busca uma ideia original e diferente para o seu convite de casamento sugiro que nos visite em http://convitesoriginais.com Garantimos a melhor qualidade! Esta caricatura dos noivos foi encomendada para um casal de futuros noivos brasileiros que vão dar enlaçe na Suiça. Good night people! Hope everyone is having fun! 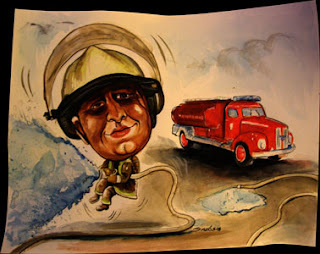 This is a watercolor caricature comission i did a while ago to present a firefighter a special profession that is not so professional here in Portugal as many are volunteers, in fact i believe its really the only peace corps in the world in this situation aren't we Portuguese special or something? True heroes that's what i think of them. 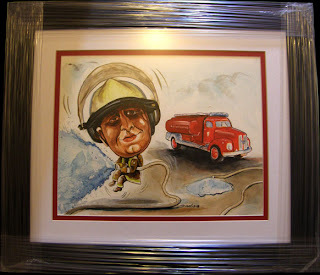 This painting was commissioned to be handled to Madeira Island in case you never been there just go! Good morning everyone! Wish all a good week! 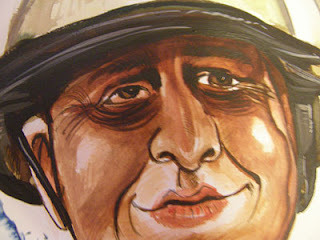 It´s been a while since i don't paint in watercolours, except for a commission i did a while ago which i will post soon. Thinking on that and because i believe its always good for the artist to grow, handling with different materials, developing his vision on technique, composition and colour. So i decided to illustrate Amy Winehouse (again) and Barack Obama. 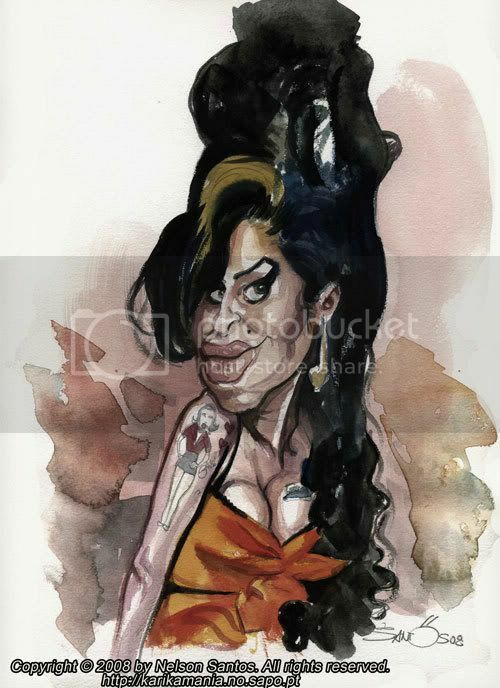 Amy was coloured in a cold pressed watercolour paper 200gr/m2 and Obama on a cheap Xerox paper 80gr/m2. You can see the special difference effects on each sheet.